Elounda SA Hotels and Resorts are comprised of three luxurious seafront properties in a setting of outstanding natural beauty in north-east Crete, Greece. 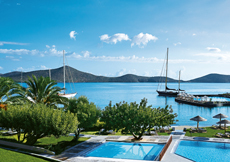 The five star elounda mare hotel overlooks Mirabello Bay, in an area of outstanding natural beauty. Since 1988, it has been a member of the prestigious international RELAIS & CHATEAUX hotel group. Exuding sophistication and exclusivity, the elounda mare hotel has an unparalleled reputation for its attentive and personalised service. With its award-winning restaurants, comprehensive leisure facilities and exquisite design, it is the ideal choice for the discerning traveller seeking a relaxing holiday in a serene and intimate setting. 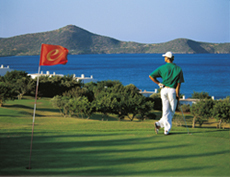 When arriving at Elounda, the first view from the hilltop is a panorama of the Bay of Mirabello, where the foreground is dominated by the porto elounda DE LUXE RESORT and the green expanse of its golf course. Designed with respect to the architectural tradition of the land, this unique complex is an oasis of recreation comprised of the hotel, the seafront bungalows and villas, the village square and numerous restaurants and bars. The recreational facilities of the resort, in addition to the 9-hole par-3 golf course, include two tennis courts and a gymnasium with a variety of fitness equipment. The heated freshwater indoor swimming pool, the sauna and the hamam at “Thermais” is open to all the guests of the resort. The repeatedly awarded Six Senses Spa™, “Best Spa of the World” according to the Sunday Times Travel Magazine (December 2007), provides a truly relaxing and revitalizing experience, through many forms of holistic healings to balance the senses. Its unrivalled range of signature treatments focuses on health, beauty, pampering, stress reduction and recuperation using pure, natural and environmentally friendly products. The luxuriously appointed spa spreads over 2,200 m², setting unique standards in spa design. A hairdressing salon is also located in the spa. Naturally, for guests and their children who want to use an indoor bathing facility outside the Six Senses Spa, the resort offers “Thermais”, with a heated freshwater indoor swimming pool, sauna and steam room. The Aegean Conference Centre at Porto Elounda Deluxe Resort was completed in 2008 according to cutting-edge specifications and incorporating years of experience in functional design and facilities. Extending over 1500m2 of indoor spaces with the additional benefit of another 300m2 of covered outdoor verandas, it comprises five multi-purpose halls of various sizes, which can all be joined and separated as needed, while enjoying an incomparable view to the resort’s golf course and the sea. 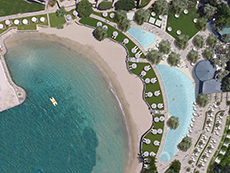 It is split into its constituent “seas” and realises endless possibilities to host a variety of different functions: the “Cretan-Sea Ballroom” has 300m2 of beautiful spaces, while the adjacent “Mirabello Ballroom” has another 110m2, and right next door are the “Carpathian-Sea” and “Myrtoan-Sea” meeting rooms, with 66m2 and 38m2 respectively. One more room completes the centre, the “Ikarian-Sea Dining Hall”, having 110m2, while large lobbies and protected verandahs offer a multitude of possibilities for breaks in an idyllic environment. 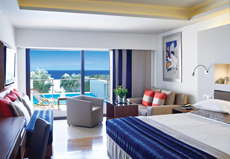 elounda peninsula ALL SUITE HOTEL is the most exclusive hotel in Greece. Positioned on a peninsular stretch of land, it enjoys an outstanding location overlooking the Bay of Elounda, and the expanse of the Aegean Sea. The view is blue as far as the eye can see. The hosts and the entire staff at elounda peninsula ALL SUITE HOTEL have been selected on the basis of their outstanding courtesy, professionalism and efficiency. Founded on a tradition of excellence in service unparalleled in Greece, the dedicated team is always at your service, whether it is for en-suite dining, private training and massage schedules, or children's care and recreation.